Loop delivers name-brand products, like Tide detergent, Axe Deodorant, or Häagen Dazs ice cream in its special containers. When you’re done with the product, you ship the empty container back to Loop, where it gets cleaned and reused for the next customer. Over the past few years, waste has become a hot topic- and justifiably so. Pictures of whales full of plastic have swept up onto the social media shore spreading awareness about the environmental effects of our consumption. Just as the problem is widespread, so too are the newest solutions, innovations, and technologies diverse and numerous. Thanks to individuals and governments who have pioneered the zero-waste movement and enacted sweeping legislation to minimize waste, now corporations are following suit and entering the new waste-free era. The newest (and perhaps most disruptive) addition? Loop Industries. 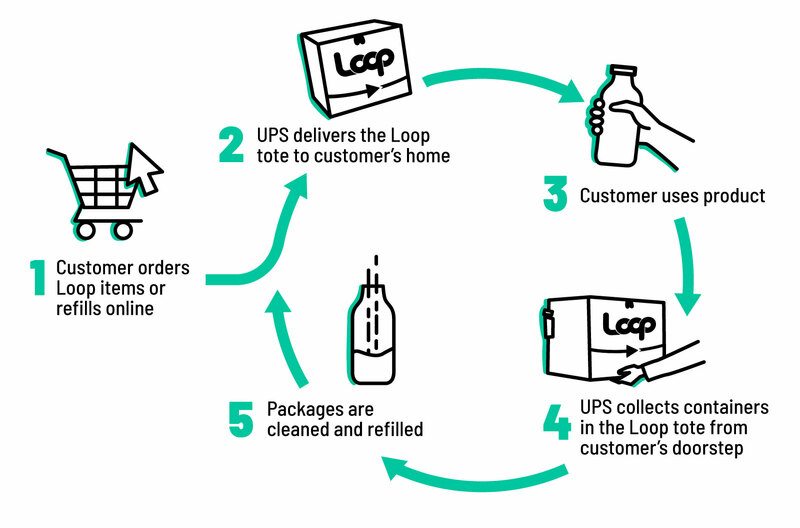 Loop is a delivery system that provides consumers with reusable packaging and is designed to fundamentally change the way we consume goods. Loop is a venture of TerraCycle, a global waste-management company that provides creative solutions to reusing and recycling products that aren’t conventionally recycled. Loop takes sustainable consumption a whole step forward by offering consumers a subscription-based package where they can purchase goods in reusable containers. When they’re done with the product, the service will take back the container, clean it, and refill it. The first product to test out the system will be Haagen-Dazs ice cream. So now we can finally eat ice-cream completely guilt-free. Haagen-Dasz will be sold in a double-walled steel container that is made to keep the ice-cream in optimum condition during transport and consumption. Product designers took this as an opportunity to enhance the entire experience of the product - in this case, the double wall is meant to be comfortable on your hands while insulating the ice-cream, the top is also designed to melt faster while the bottom will remain frozen. New York will pilot the Loop service with Haagen-Dasz’s reusable containers in 2019, offering non-dairy flavors Chocolate Salted Fudge, Coconut Caramel, Mocha Chocolate Cookie, as well as dairy flavors Vanilla and Strawberry. In May 2019, PepsiCo plans to pilot the Loop subscription system in Paris with Tropicana Orange Juice and Quaker Cruesli Chocolate. Loop has already partnered with 1,000 products including brands such as Evian, Hellman’s, Nature’s Path Organic, and Unilever, and plans to expand to many more. It seems that the milkman is returning, and bringing with him a lot more than milk.